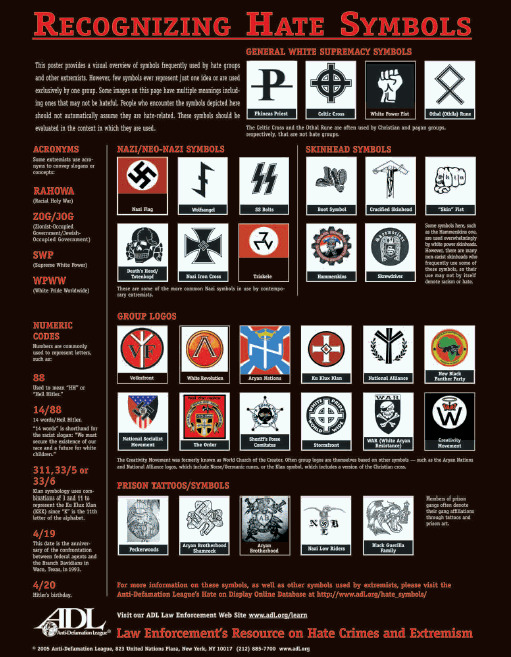 If your Regional Office wants more than 25 "Recognizing Hate Symbols" posters, enter their intended use & the total amount that you would like to order in the boxes above; then click here. After you have sent your request via email, complete your order by checking out. You will receive order status updates. Symbols are the most powerful communication tools that have ever existed. Because they have the ability to convey so much meaning, intent and significance in such a compact, immediately recognizable form, the effect that they have is tremendous. Hate symbols are more than just "signs" demonstrating racist, anti-Semitic and anti-Christian attitudes and beliefs -- these symbols are meant to instill a sense of fear and insecurity. Click here for more information about recognizing hate symbols.